Christ is risen and hell is overthrown. Christ is risen and angels rejoice. Christ is risen and life rules. With these words St. John Chrysostom concludes his Catechetical homily for the Holy Easter. Year after year, these words bring us back to the very source of our faith. We cordially greet you on the holy Resurrection of Christ, and we wish you always – in all the days of your life, in the moments of happiness and of grief, in holidays and in weekdays, in work and in leasure – to stay faithful to this fundamental Joy of the Ressurrection of our Lord Jesus Christ! ​​​Resurrection – Descent into Hell. On the feast day of St Clement of Rome we want to share our joy with you. This year St Clement showed himself in a new way to us thanks to an unexpected present – the icon, which a boy named Vanya painted on glass and presented to our Centre. We thank God and rejoice that this year we, Christians of the East and the West, celebrate this Feast of feasts together on the same day! Descent into Hell, late 15th c.
of Polyana village in Lviv region. CHRISTUS RESURREXIT ! ΧΡΙΣΤΟΣ ΑΝΕΣΤΗ ! We wholeheartedly congratulate you with the joy of the Christian Pascha! 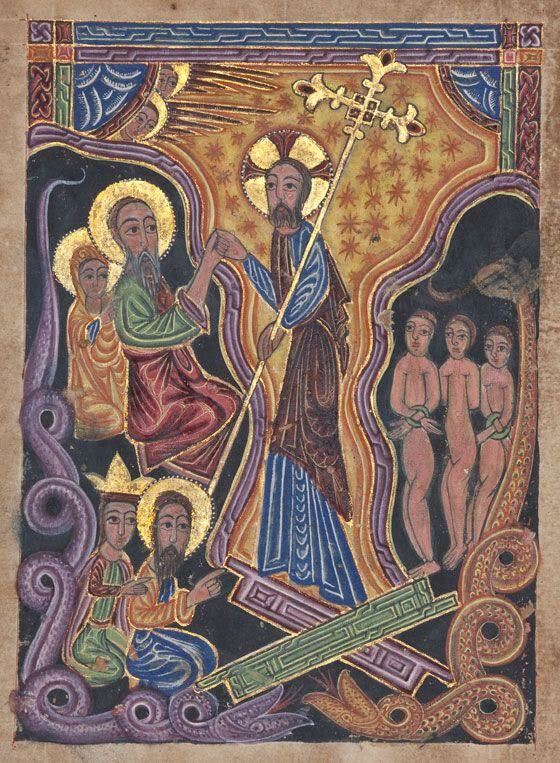 a prominent Armenian manuscript illuminator in Persia. The Resurrection of our Lord is life for the dead, remission of sins for the sinners, and glory for the saints. This is why St. David prompts every creature and all creation to the most joyful triumph of this day, saying: “This is the day which the Lord hath made; we will rejoice and be glad in it!” (Ps. 118:24). This day penetrates everything and illuminates everything, it embraces heaven and the nether regions: because the Light of Christ cannot be blocked by walls, divided by elements, obscured by darkness. The Light of Christ is the day without evening, the infinite day: it shines everywhere, it illuminates every place, and nothing can hide from it. We wholeheartedly congratulate you on St. Clement’s Day!